The Winchester Model 70 is called “The Rifleman’s Rifle” by Winchester and it is a title it well deserves. It has been made in a large variety of calibers from the ear splitting shoulder crunching .470 Capstick in recent years down to the .22 Hornet back before and after World War II. The Winchester Model 70 in .22 Hornet was made between 1936 until 1963 by which time 20,306 had been made, the vast majority being made after World War II. Prior to World War II only 3,500 Model 70’s in .22 Hornet were made out of a total pre-war production of 50,000 rifles. This makes a .22 Hornet Model 70 a collector’s item and really good pre-war examples can fetch surprising amounts of money depending on model and condition. The Super Grade was made in .22 Hornet as well as more plain Jane varieties. Winchester Model 70 in .22 Hornet coming up for sale by Rock Island Auction on June 23rd, 2017. The .22 Hornet may seem to be a very small and low powered cartridge in this modern day and age and in truth it is. But if you are looking for a small game cartridge that has a very light report and negligible recoil then the .22 Hornet is still one of the best caliber choices you can make. For fox whistling the .22 Hornet is a superb caliber and the Winchester Model 70 in our pictures would be an excellent fox whistling rifle either with or without a telescopic sight. As long as you can whistle your fox within 125 yards or so the .22 Hornet will finish the fox and do very little damage to the pelt. With its short 20″ barrel this Winchester Model 70 is a near perfect fox whistling rifle and would also make a near perfect turkey rifle. The other use for the .22 Hornet in a short light rifle is for turkey hunting. Prominent American sportsman Henry Edward Davis called the Winchester Model 70 in .22 Hornet “The best commercial rifle for wild turkeys the world has ever seen” and despite the prevalence of more powerful small caliber rifle cartridges that are now on the market I believe it remains true today. 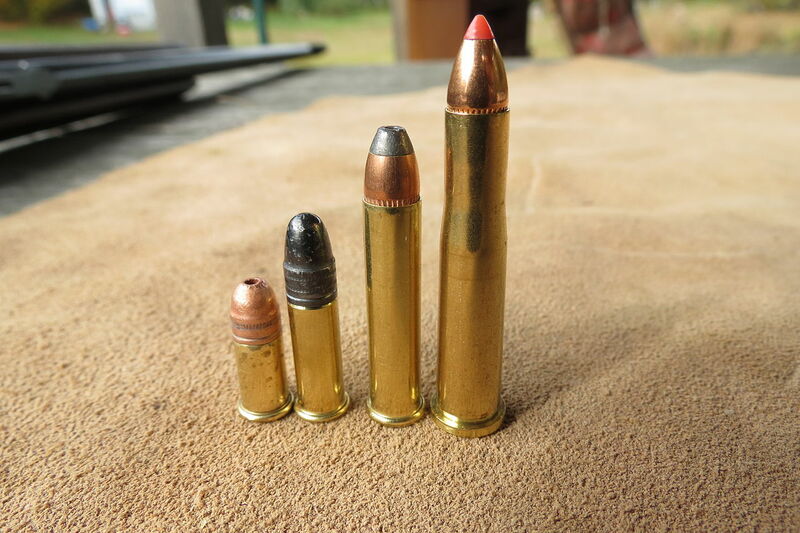 The light report of the .22 Hornet yet its indisputably sufficient power to humanely dispatch game the size of foxes and turkeys makes it a great cartridge. Put that cartridge in a Winchester Model 70, “The rifleman’s rifle“, with a 20” barrel making a short lightweight package and you have a perfect turkey rifle. The .22 Hornet (right) with other popular small game cartridges. From left to right; .22 Short, .22 Long Rifle, .22 Winchester Magnum, and .22 Hornet. (Picture courtesy Wikipedia). One of these rare “perfect turkey rifles” is coming up for sale by Rock Island Auction on June 23rd, 2017. Rock Island Auction describe the condition of this rifle as follows: “NC – FINE: All original finish 90% – 94% or better, some dings in wood wear commensurable with percent of finish. PRF – PROFESSIONALLY REFINISHED OR RESTORED. WW – WOOD IS WORSE FOR THE PERCENT FINISH RATING GIVEN”. Expected sale price for this rifle is USD$1,700-$2,750. Because this is a very collectible rifle it may not get used for fox whistling or turkey harvesting although we hope it does. A “rifleman’s rifle” should not be wasted just taking up space in the gun safe. It should be out there being used for what it was designed to do. (All pictures courtesy Rock Island Auction except where otherwise noted).